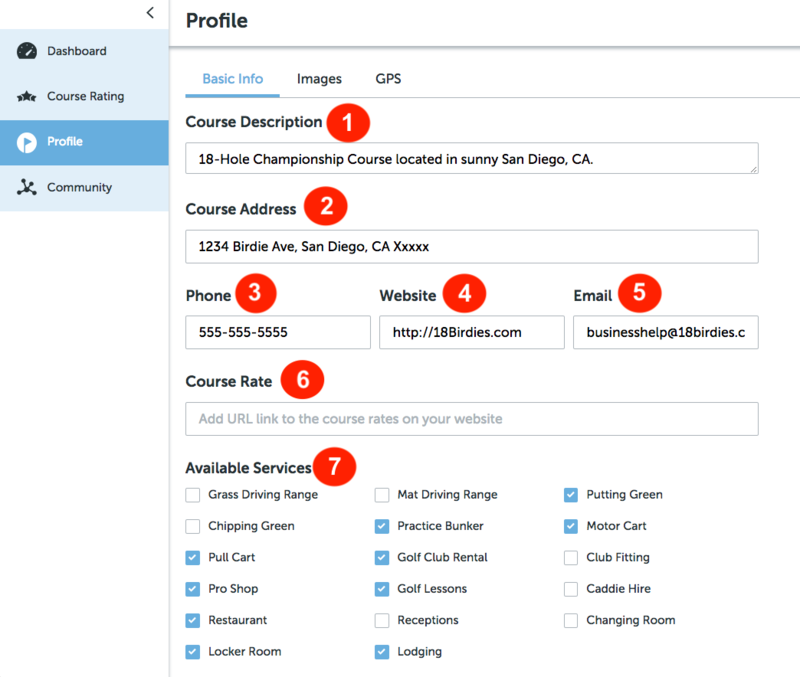 To access your course Profile page, click the 4 squares in the upper right corner of the platform, choose Course Intelligence, then Profile from the left hand menu options. The Profile tab is designed for you as a course owner or operator to manage the way your course profile appears in the 18Birdies app. Here you can update things like your course description, contact information, available services, even course logo and pictures. 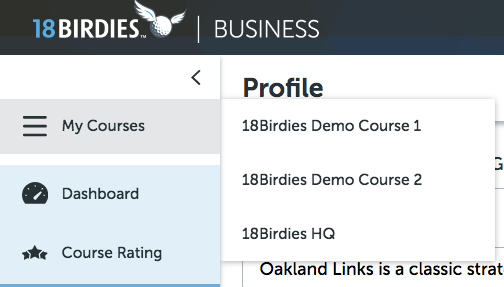 As soon as you update any of the information in the Basic Info or Images section of the Profile page, the 18Birdies app will be immediately updated with your changes. 1. Course Description - Enter a brief description of your golf course. 2. Course Address - Enter the physical address of your golf course. This will allow 18Birdies users to easily get directions to your course. 3. Phone - Enter the general phone number for your course. This will allow 18Birdies users to easily call you from the app. 4. Website - Enter the URL for your course website. This will allow 18Birdies users to easily click to access your course website. 5. Email - Enter the club email address for your course. This will allow 18Birdies users to easily email your course from the app. 6. Course Rate - Enter the URL to your course website where the play rates display. If you do not have this displayed on your website, just leave it blank and the option to access course rates simply will not be available on your course profile in the 18Birdies app. 7. Available Services - Check all the services that are available at your golf facility. Make sure you remember to Save your changes! 1. Course Logo - The image you upload here will appear on your course profile home page in the 18Birdies app. A square PNG or JPG image is recommended. A PNG format may appear with a transparent background. Simply click the image icon and choose an image from your computer to upload. 2. Feature Image - This image will also appear as the background photo on your course profile in the 18Birdies app. First, delete the existing default image, then click the image icon and choose an image from your computer to upload. 1280*800 px is is the recommended size. 3. Course Pictures - Here is where you can upload a library of pictures from your course. 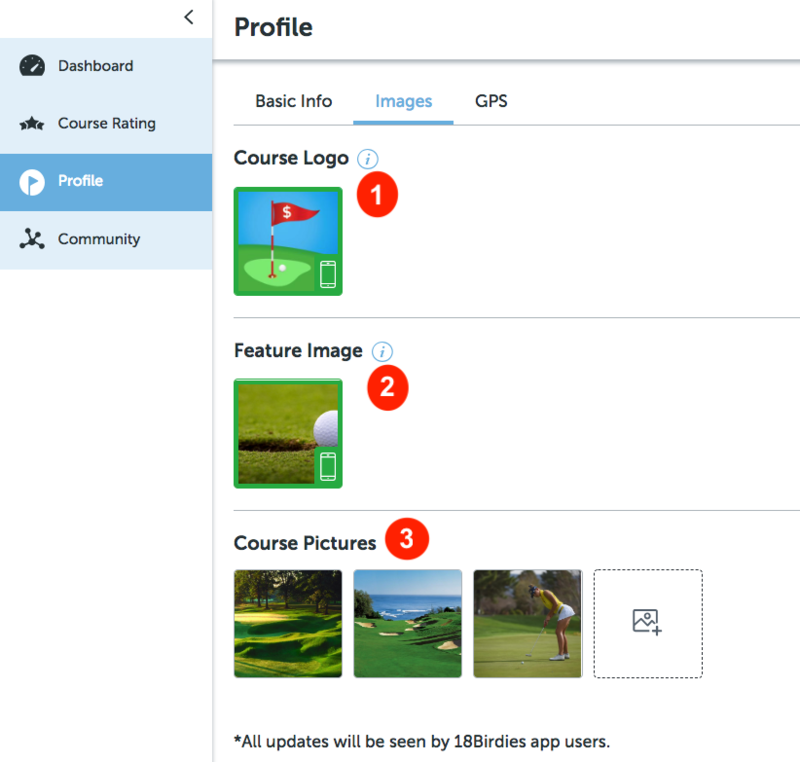 From this page, you can upload one or many course photos, as well as see and manage the course pictures that other 18Birdies users have uploaded from their personal profile. 18Birdies app users that follow your course and/or play at your course, have the option of adding pictures they take during their round at your course, and adding them to your course profile. Those pictures will appear here, in addition to the ones you upload. The GPS tab is VIEW ONLY. You do not have the ability to make changes or edits to the scorecard or GPS mapping from this Dashboard. You do however have visibility into the scorecard yardages, par values, and hole handicap values, as well as GPS mapping that 18Birdies has on file for your course. If you see something that is incorrect, or something changes at your course (i.e. new tees added), please contact customer support so that they can make the appropriate changes.